Springtime in the Kofas. 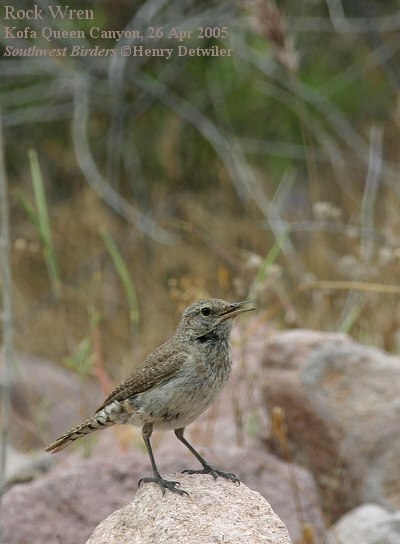 Carpets of wildflowers, stark and dramatic landscapes, the highest peak in southwest Arizona, sweeping views over the desert, and then there are the birds! 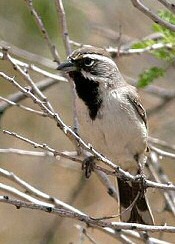 A few of the birds in this canyon cannot be found anywhere else in Southwest Arizona, or even in neighboring California. 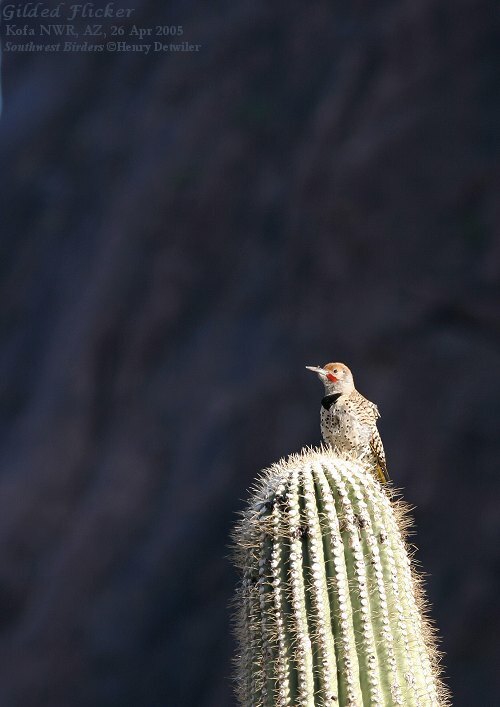 Some of these birds can be seen more easily in Southeast Arizona, but not against this dramatic backdrop of the Kofa Mountains. 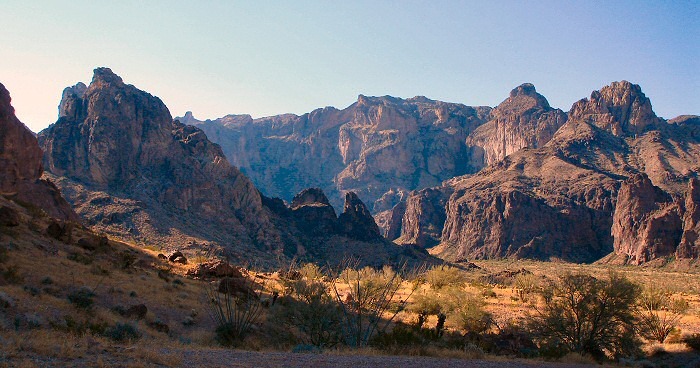 Cut through beautiful reddish volcanic rock called rhyolite, eroded by water and wind over time, scenic canyons and towering peaks surround you at every turn. 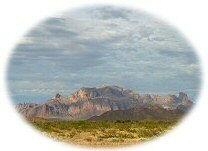 Signal Mountain is the highest peak in southwestern Arizona, at 4877 feet. 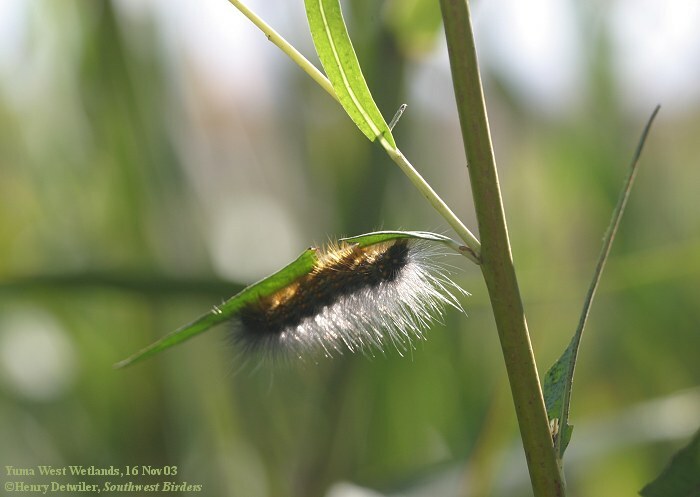 Camping is a fine way to experience this area to the fullest extent. The black desert sky will open up a glorious expanse of unbelievably bright stars. And looking at them with your binoculars or scope will reveal depths in the sky invisible to the naked eye. Even without a moon, you can see the edges of the canyon walls silhouetted against the sparkling constellations of the night sky. 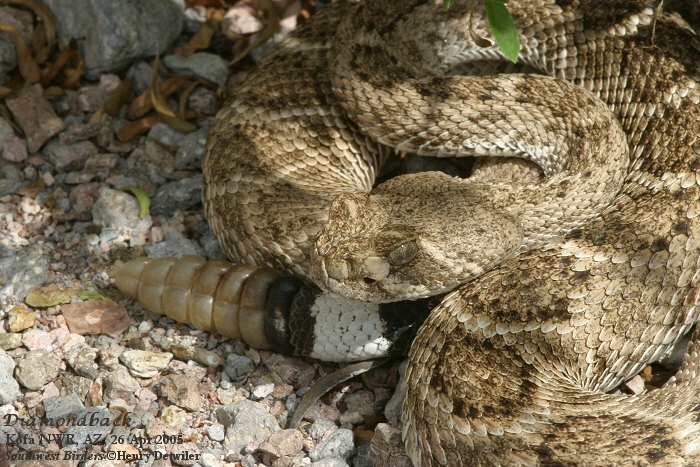 But please don’t camp within ¼ mile of water holes (like Cereus Tank)—that’s prohibited for the sake of wildlife. To serenade you to sleep, Elf Owls will cackle and Western Screech-Owls will whistle, all while Poorwills give their mournful, two syllable “poor-will” call. 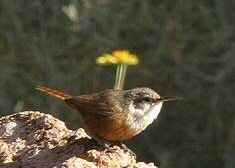 If you spend the night in the canyon, or drive in early, you’ll be treated to a symphony of bird song as dawn breaks over the canyon walls: whirring Rock Wrens, the descending tremolo from a Canyon Wren, plaintive calls of the Phainopepla and Canyon Towhees, melodious Scott’s Orioles, and tinkling Black-throated Sparrows, to name but a few. 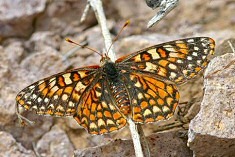 Over the course of several spring-time visits, we've seen 52 species here. A loose rock clattering down a ledge could be a sign that Desert Bighorn Sheep are on the move—they’re fairly common around Signal Mountain, so keep scanning the mountainsides to get a glimpse. 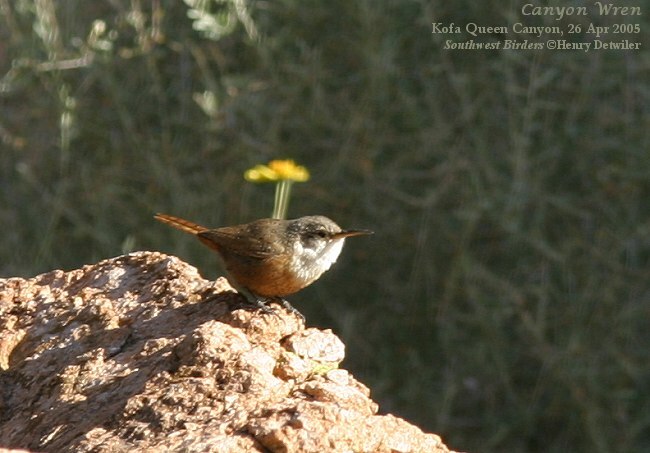 Link to see my Birder's World article on Kofa Queen Canyon. 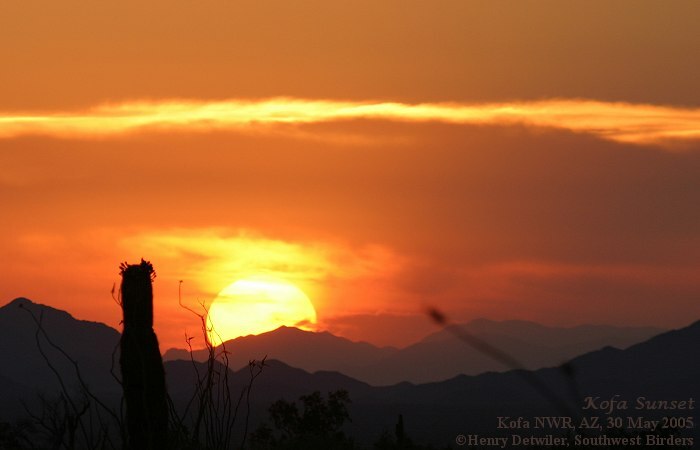 Kofa National Wildlife Refuge (NWR) is composed of 665,400 acres of upper Sonoran desert northeast of Yuma, AZ. 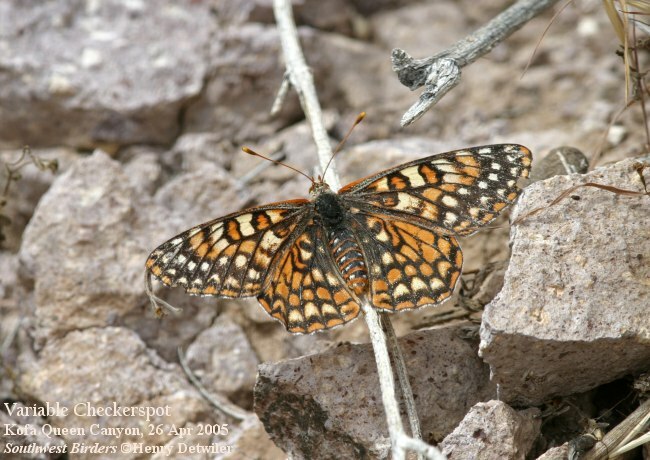 - From Yuma, drive east and north on Highway 95 for 40 miles to reach the first publicly accessible point of the refuge—Caste Dome Road. 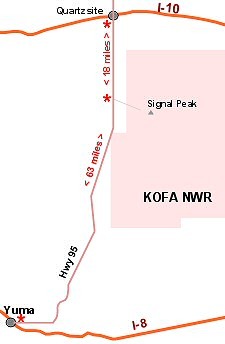 - To reach the Palm Canyon turnoff (which takes you to Kofa Queen Canyon), drive Highway 95 for 63 miles beyond the I-8 & 16th Street intersection. 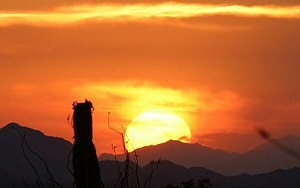 - To reach the same Palm Canyon turnoff from Quartzsite, drive south 18.7 miles on Highway 95. - 0 miles: head east on the gravel road to Palm Canyon. If you drive to the end of this road, you’ll end up in 7.3 miles at the parking lot for Palm Canyon, which is best known for its small stand of native California Fan Palms (one of but a few such groves in Kofa NWR, and the only ones left in Arizona). 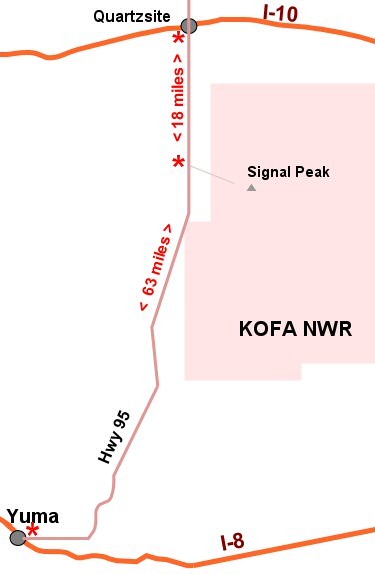 - 8.0 miles: you’re at the mouth of Kofa Queen, guarded on the south side by a large monolith. 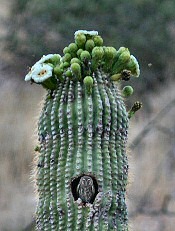 This feature may be the nesting site of a Prairie Falcon, which can often be seen or heard calling from the summit. - 8.0+ miles: you’ll be navigating the most suitable path through the wash—follow the tire tracks. 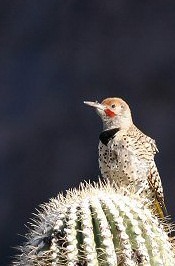 Stop often to look for Black-throated Sparrow, Black-tailed Gnatcatcher and Canyon Towhee in the brush, Gilded Flicker in the huge saguaro cacti, showy Scott’s Oriole in the red-blooming ocotillos, hummingbirds in the flowering chuparosa (Anna’s, Costa’s, Black-chinned, & migrant Rufous & Calliopes), Cactus Wren in the chollas, and Canyon Wren in the cliff-side boulders. - 10 miles: you’ll see the ridge & spire ahead of you, and a narrow wash entering the canyon on your left (north side). This is Cereus Wash, and leads uphill for about half a mile to Cereus Tank, a man-made watering hole for sheep and other wildlife. 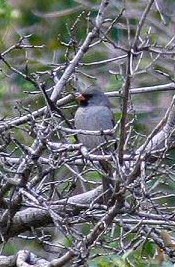 Look in the trees for Lesser Goldfinch, Phainopeplas, and in the surrounding rocks for Rock Wrens. 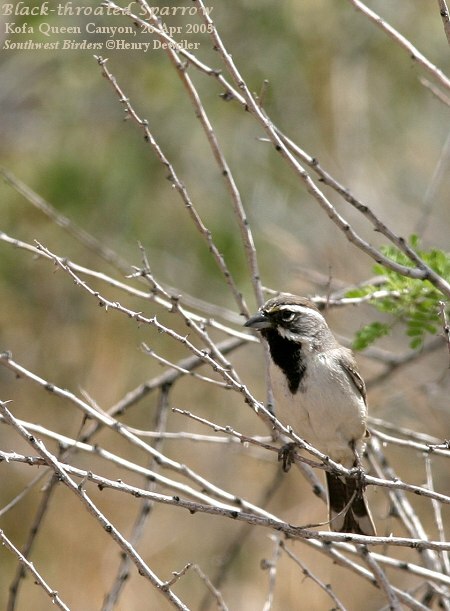 In this canyon, as well as others, you may hear the descending trill of the Canyon Wren, or get a glimpse of this handsome white-throated, chocolate-colored songster. 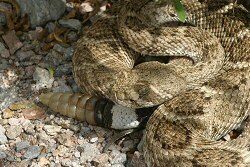 One spring evening I had excellent looks at two Western Diamondback rattlesnakes in this wash.
- 10.1 miles: a rocky spine juts out from the north side of the canyon, with a prominent spire sitting atop it. An overhanging rock shelter and a partial rock wall point to its use in historical times. It’s a good landmark, and a fine spot to camp. 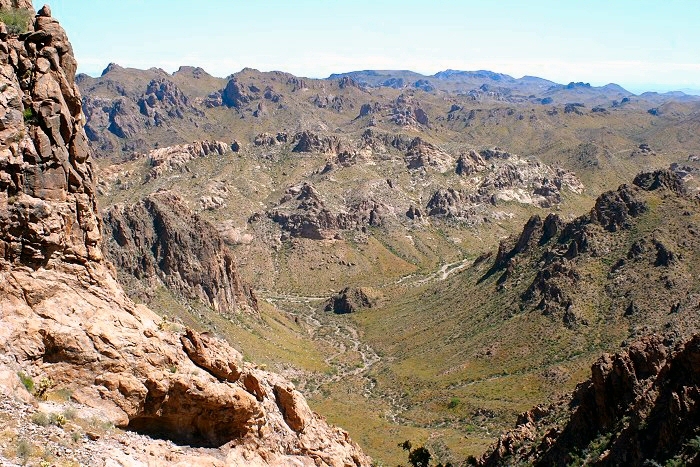 - 10.7 miles: here on the south side a major drainage flows into the canyon. 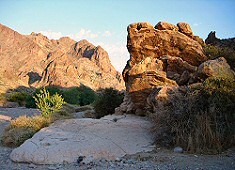 Indian Wash collects run-off from Ten Ewe Peak, Signal Mountain, and other peaks, and funnels it down into Kofa Queen Canyon. The mouth of Indian Wash here is the start of the hike up to Signal Mountain saddle described below. - 11.3 miles: A small jumble of rocks jut out of the canyon where it widens out, with metate depressions in the smooth flat surface. This is another good wide spot in the canyon to camp. - 11.8 miles: End of the line for vehicles. 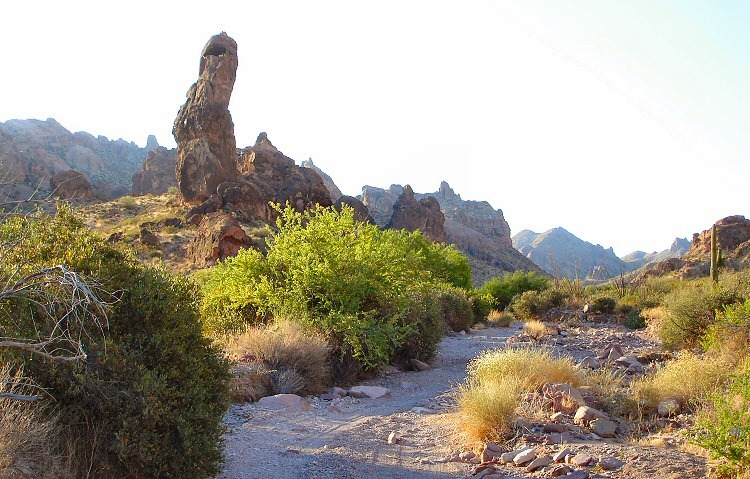 Continue hiking up this road past the gate to reach the old Kofa Queen Mine, which was in production during the late 20th century. looking south towards Ten Ewe Peak. 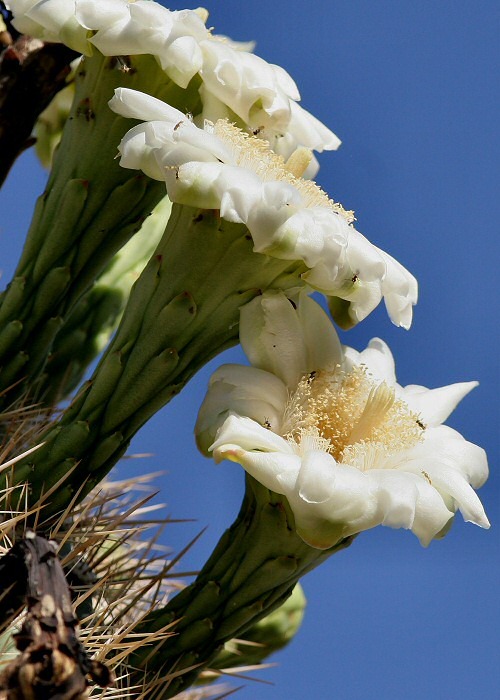 You can hike almost anywhere in Kofa Queen Canyon, but to see some of the best wildflower displays, and a couple of the target birds, consider a trip up Indian Wash & Indian Canyon, traversing the side of Ten Ewe Peak, that takes you to the saddle and basin below Signal Mountain. 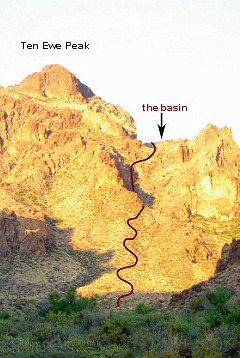 See the trail outlined on the photo to the left. Keep following the trail all the way to the top, and you’ll be treated to views of California, Arizona, and all the surrounding ranges. About a quarter mile in, you'll come to a "Y" in the wash (at the base of the squiggley trail on the map), with Indian Wash coming in from the southwest, and Ten Ewe Wash coming in from the southeast. At this point, you'll hike up out of the wash, heading due south. This gentle grade will head up the west side of Ten Ewe Peak. 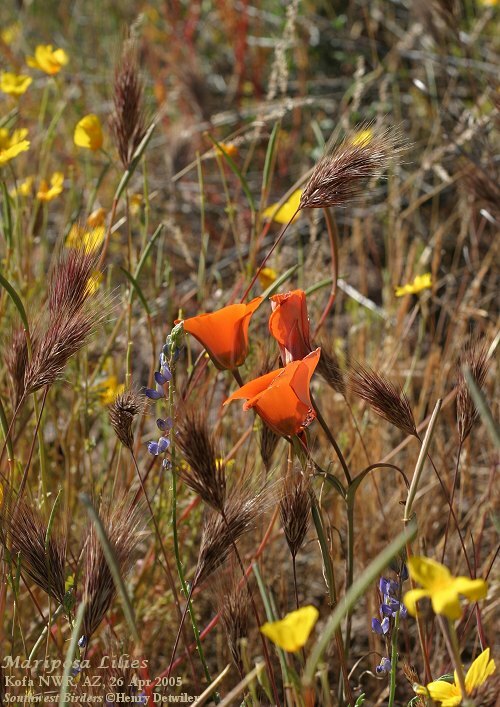 This is the portion of the hike that will be awash in showy flowers during the early spring following a wet winter. The gentle grade up this hillside becomes less gentle, and you'll encounter your first switchbacks as you scramble uphill (see picture at left). 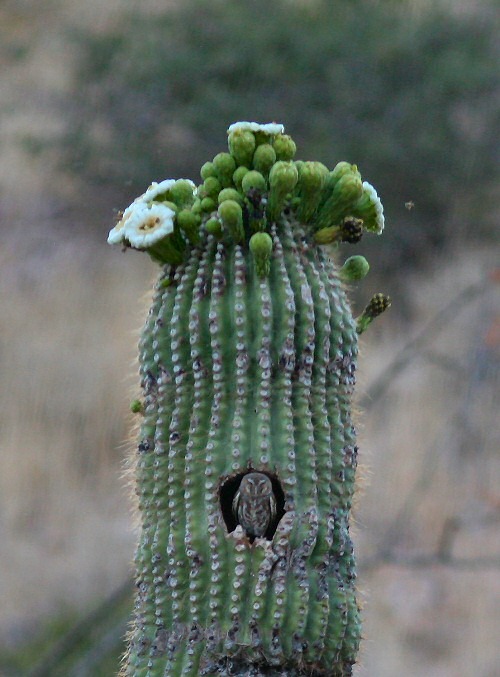 Watch out for fierce cactus spines waiting for the unwary. 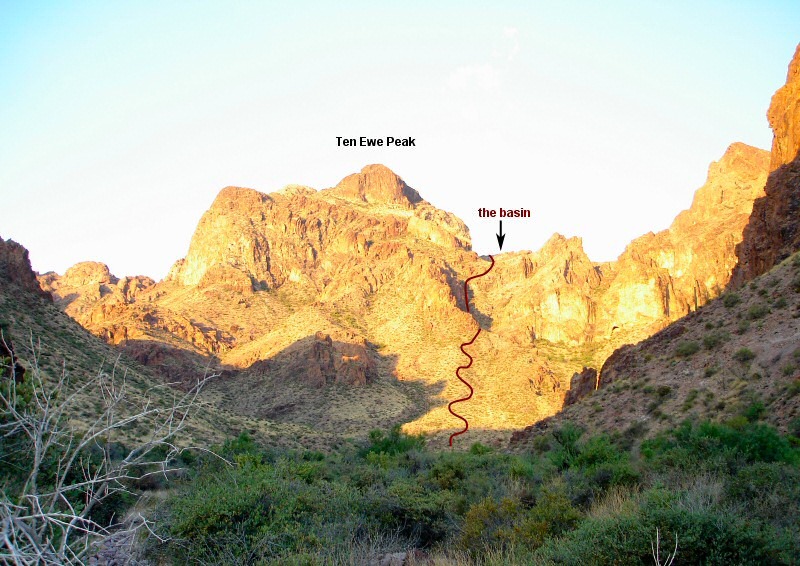 Once you cross over to the west side of Ten Ewe Peak, your ascent will once again be more gradual, and you’ll start encountering Scrub Oak and many more shrubs. 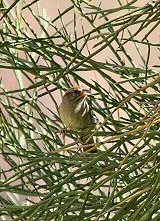 Early in the spring mornings this is where you should listen for the songs & calls of the Black-chinned and Rufous-crowned Sparrows. 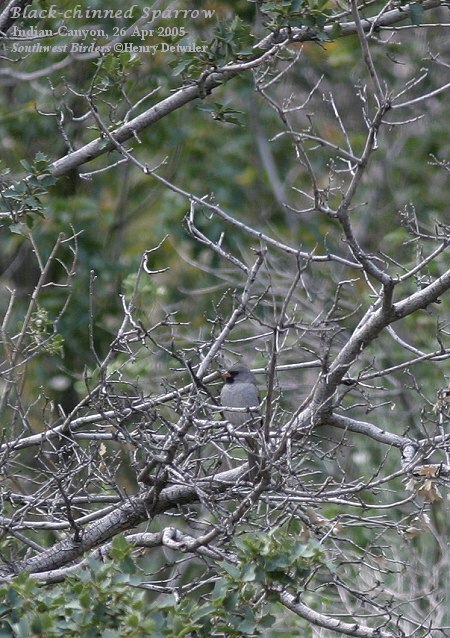 Up along the higher portions, you may be “buzzed” by White-throated Swifts hawking for insects, an exhilarating experience if it doesn’t startle you too much! Keep looking up in the sky and you may be fortunate enough to see a Golden Eagle soaring on the thermals. More common are American Kestrels & Red-tailed Hawks, and Turkey Vultures. The saddle is half the way up to the peak of Signal Mountain, and makes a fine vantage point from which to admire Indian Canyon and take a break. 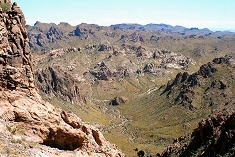 A basin (see picture at left) on the south side of the saddle has a fair growth of oaks, and a corresponding variety of birds. 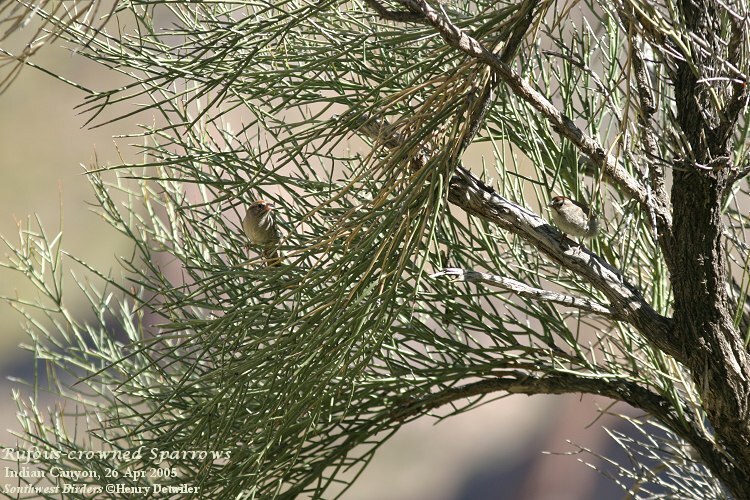 Look here for flycatchers, sparrows, and warblers. We've never gone past this wooded basin, but the rest of the hike to the top of the peak can be done in another two hours. Be prepared. This is a remote desert area without drinking water—take 2 gallons of water per person per day. 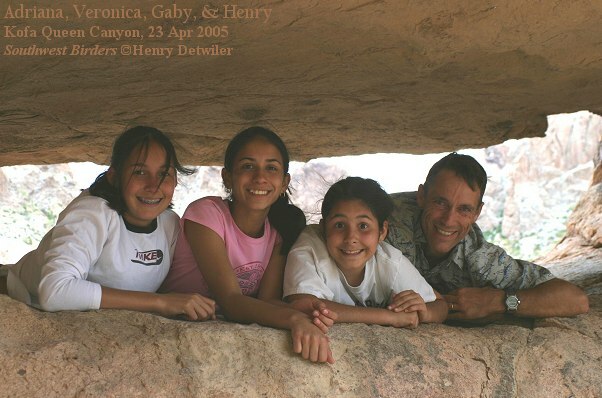 Let someone know your schedule, and realize that there is no cell phone coverage within the canyon. You can take a passenger car to the Palm Canyon parking lot, but you'll need high clearance to get to, and into, Kofa Queen Canyon. 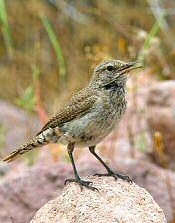 Summer time is best avoided, when daily temperatures often soar above 110, and the birds seem to have disappeared in the shimmering heat waves. Spring is usually mild, but you should be prepared for rain, heat, and cold. 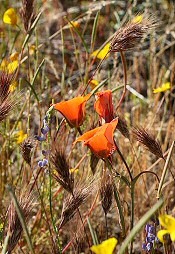 Feb through April are usually best for wildflowers, and April is the best time for birds. Additional web pages with photos and info about KOFA Queen Canyon and KOFA NWR.